Photo Galleries Purple4Polio at Clitheroe Market! Bonfire cash distributed. Club Council Update from Flexible Rotary Fifty Years a Rotarian! Young Musician 2017 Technology Tournament 2019 Membership & Membership Development Last Night of the Proms Purple4Polio the results! IT Schools Africa Update...... Cliderhow - The Club's Weekly Bulletin Flexible Rotary - report of meeting on 29 May Presidential Handover 2016 - 17 Rotary 2 - "Flexible Rotary" New Year PHF's Thank you Julie! Youth Service District Council Meeting Clitheroe Food Festival 2018 Skydiving challenge.... Bonfire Committee President Frank's Valedictory Meeting Bill’s Big 542 in 2016 Challenge for Cancer Research UK Clitheroe Community Bonfire 2018 Rotary 2 Video links Rotary at Work in the Ribble Valley Community Service District Council Meeting Rotary Bowling at Waddington Club. Mary has a ball! Youth Speaks update Sports Rotary Golf Day 2018 Purple4Polio IT4Africa Purple4Polio Rotary Grand Tour Life Education Spring Clean.... International District Council Meeting Rotary Golf Cheque Presentation 2018 President Mary hand over the cash and her chain! Young Chef 2019 National Rotary Day/Thanks for Life New Year's day @ Clitheroe Rotary Club Newsletter Booths Supermarket Collection 2018 The Beetle takes shape Foundation Pounds for Polio More Community Service in Clitheroe World Polio Day 2017 Three new Paul Harris Fellows Castle Bandstand get a Rotary makeover Around the Schools with the Purple4Polio exhibit. Purple4Polio comes to Brungerley Park! Blood Pressure Awareness Day 2018 Fund Raising 85th. Clitheroe Rotary Birthday Party! Two New PHF's Smalls for All - Pants to Poverty! Club Service Training Page Rotary Fellowship Exchange 2016 Litter pick Life Education at Christmas! A couple of months back I was asked by Malcolm Baldwin (last year’s District 1190 Governor and one of my co-organisers on the Ribble Valley Ride cycle sportive) if I’d like to do the Purple4Polio Grand Tour with him. Not knowing what on Earth he was talking about I looked it up here and thought it looked like a good idea. There wasn’t much information then, but Roger Franks from the Rotary Club of Upper Eden was going to do it, in a converted dump truck with the slogan “Dump Polio” – Roger is the man who last year built the country’s only fully-working replica Iron Lung, a remarkable piece of work which reminds us what it was like when there was Polio in the UK – certainly within our living memories. So we registered on the Rotary website and sat back waiting for more information. All we knew at this time was that it was to be a four day tour of the UK, visiting as many different Rotary Districts as possible – each district would set up a check point – so as to raise awareness of Rotary’s determination to end Polio for good, and hopefully to raise some much-needed funds too (did you know that the Bill & Melinda Gates Foundation contributes $2 for every $1 raised by Rotary? Across the world, Polio has been reduced from over 300,000 (!) new cases per year less than 20 years ago to fewer than 20 last year. It is now present only in a few areas of Afghanistan and Pakistan; Type 2 and Type 3 Polio have already been eradicated, with only Type 1 left hanging on. We are so close, but we mustn’t take it easy now, as it would be so easy to give this devastating virus a chance to regroup and return with a vengeance. Hence the need for initiatives like this tour. We thought it would be nice if someone were to lend us a car, but although I dropped a few hints here and there, I guess it was too big an ask. Then, at last weekend’s District 1190 Conference in Penrith (in between the snow and the fire alarms) we listened to National President Dennis Spiller’s talk, during which he mentioned that his distinctive VW Beetle had only cost a few hundred quid. Why didn’t I think of that before? So on Sunday I raided Val’s piggy bank and checked out ‘Cars For Sale’ on Facebook. 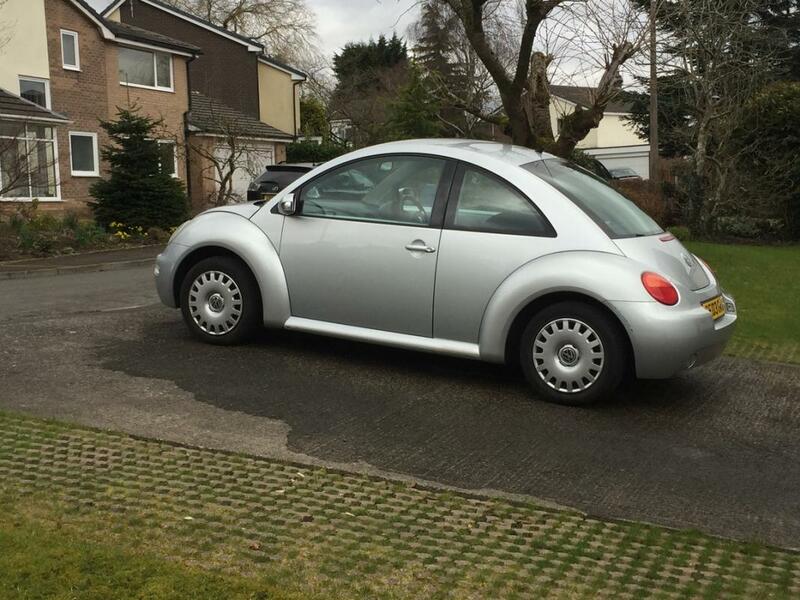 Not being one to let the grass grow, as they say, by Monday evening I was in Preston, looking at a 15-year old silver VW Beetle with 137,000 miles on the clock and a few rough edges – but it seemed to run well! A quick handshake and the handover of a bit of cash and the car was mine! So far I’ve parked it in the drive and cleaned it, to find rather more blemishes than I noticed in the gloaming twilight of Preston, but... it looks like it will do the job. Having taxed it, I’m sorting out the insurance now (sponsored, I hope – I’ll let you know which firm in the next blog), talking to a garage about a thorough check-over and service, and another company to make some decals so that the car really stands out. Then it’s a case of finding sponsors to take advertising space on the car in exchange for a contribution to the End Polio Now campaign. It looks like I’ll be the co-driver on the Tour, as I’ve got a bit of experience on the maps and Malcolm is an ex-police driver. So if you want to support the cause and help to End Polio, please get in touch!